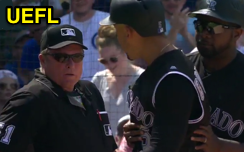 HP Umpire Marvin Hudson ejected Rockies RF Carlos Gonzalez (strike three call) in the top of the 5th inning of the Rockies-Cubs game. With none out and the bases loaded, Gonzalez took a 1-2 sinker from Cubs pitcher Jake Arrieta for a called third strike. Replays indicate the pitch was located over the inside edge of home plate and thigh-high (px .822, pz 2.143 [sz_bot 1.627]) and that all pitches during the at-bat were properly officiated, the call was correct. * At the time of the ejection, the Cubs were leading, 4-1. The Cubs ultimately won the contest, 7-5. This is Marvin Hudson (51)'s first ejection of the 2017 MLB regular season. Marvin Hudson now has 7 points in the UEFL Standings (3 Previous + 2 MLB + 2 Correct Call = 7). Crew Chief Jerry Layne now has -1 points in Crew Division (-2 Previous + 1 Correct Call = -1). This is the 63rd ejection report of 2017. This is the 26th player ejection of 2017. Prior to ejection, Gonzalez was 0-3 (SO) in the contest. This is Colorado's 2nd ejection of 2017, 2nd in the NL West (LAD 5; COL 2; SD, SF 1; ARI 0). This is Carlos Gonzalez's first ejection since Sept 9, 2011 (Mark Carlson; QOC = Y [Balls/Strikes]). This is Marvin Hudson's first ejection since September 14, 2016 (Jose Ramirez; QOC = U [Throwing At]). Wrap: Colorado Rockies vs. Chicago Cubs, 6/11/17 | Video via "Read More"